Hey everyone! Are you enjoying all the Mama Elephant highlights this week? Today we're all highlighting the new stamp set, Origami! I took my inspiration from my childhood in Hawai'i. Senbazuru is a Japanese tradition of making 1000 origami cranes (or some do 1001) for good luck or to celebrate long life. The paper cranes are strung together so that they can be hung up. It's really a beautiful tradition. 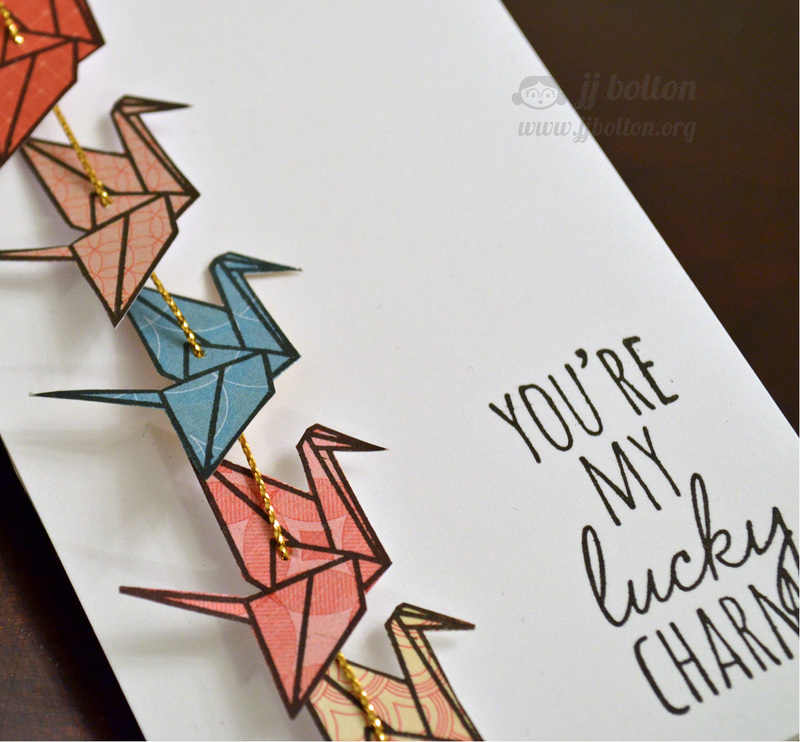 Each crane was stamped onto a different patterned paper. Then I fussy cut each one and strung them on gold twine. The sentiment is from Love Quotes and it seems very appropriate for my lucky cranes! Thanks for checking in today! Come back tomorrow for the last of the stamp highlights and today go check out what the rest of the DT has in store for Origami! WOW -- I love the colors you chose for the origami swans -- so elegant and I love the tall card! I love your crane colors and the card design. And that sentiment goes so well with the cranes. I've heard both 1,000 and 1,001 cranes, too. I've helped fold origami cranes for many brides. 1,000 cranes is a lot of cranes to fold. LOVE!!! What a great idea to string them together like that! Great paper choices and I love the height too. I love & need this set! My dad taught me how to do my first origami crane! Oh I LOVE this JJ! We did that for my brother and SIL's wedding. LOVE!!! Very creative! Love the height of this card. Fantastic card, LOVE that how you strung them each! Wow, this is fabulous! I love all the colors. I love your clever design, JJ! Beautiful choice of papers and sentiment, too! Thank you for sharing your tradition from childhood, too...I've seen photos of cranes that were used in a wedding reception, and it really is quite beautiful! I'll bet it's amazing IRL!!! Wow, what a fun idea! I just ordered this set and would love to try a tall card! Awesome! I remember a book I read as a child about a girl and a thousand paper cranes. Such a beautiful memory and card. amazing!!!! and i love the story behind this card too!! it's so sweet!! all of the colors of the different cranes are just great! love this! amazing :) brilliant idea and mind blowing execution !! Yep, I folded 1,000 cranes for my wedding! Love your patterned paper ones and the gold twine and sentiment are perfect!